I was up at Slieve Gullion today and decided to go and visit one of the ancient archaeological gems of Ireland that I had never seen before - the Calliagh Berra's House. 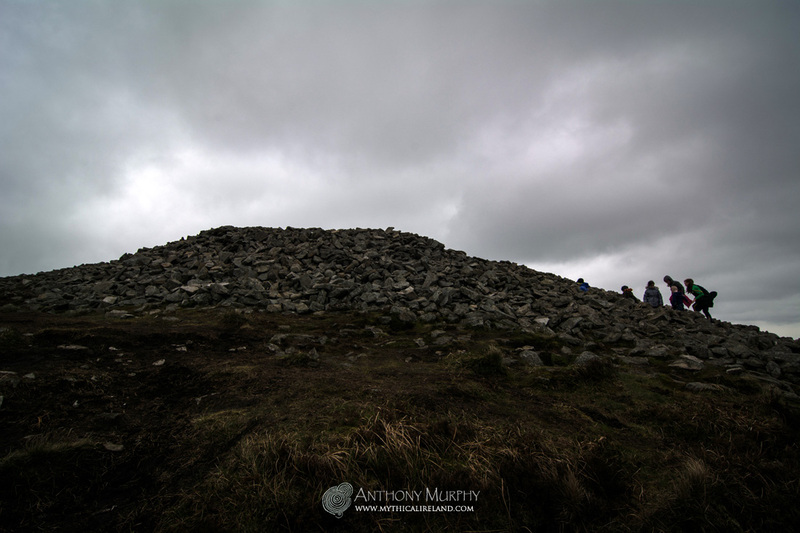 This is a passage-tomb with covering cairn located on the summit of Slieve Gullion in County Armagh, at 570m above sea level. 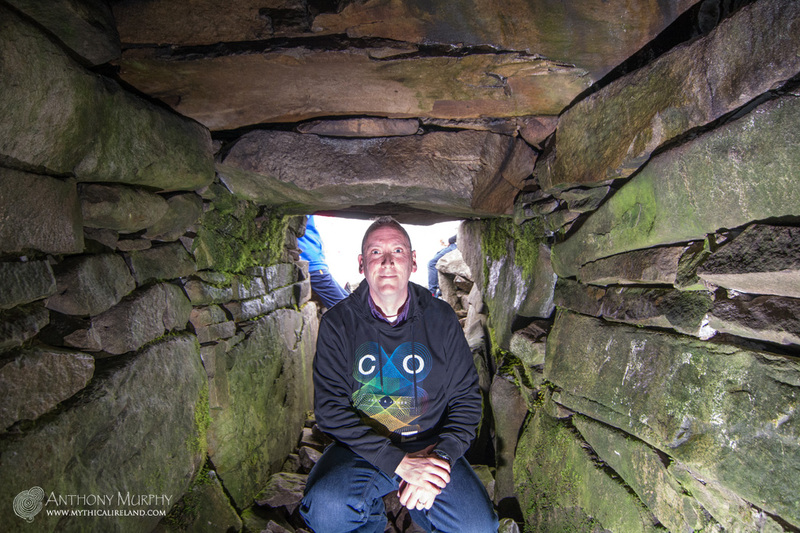 It is the highest passage-tomb in Ireland. 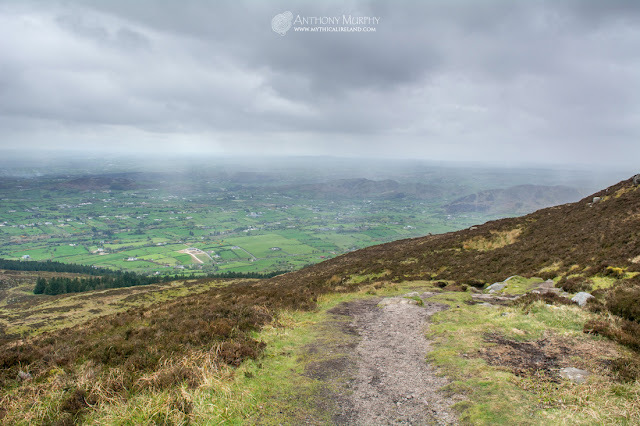 Setting out on the ascent up the path towards Calliagh Berra's House on Slieve Gullion. Thankfully, there's a roadway that brings you to a small car park that is already 360m above sea level, so the walk/climb on foot is only a further 200m or so in elevation. Still, despite our brisk pace, it took my teenage sons and I about half an hour to make the climb. It was a dull day, although not cold, with only a light breeze. All the time it felt like it was going to rain but it mostly held off except for a very light drizzle for a few minutes at the top. 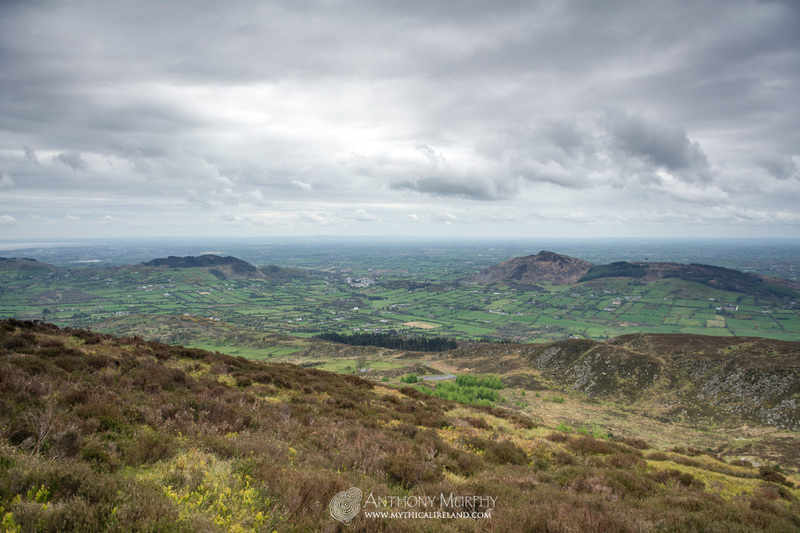 Looking south from Armagh towards Slieve Fuad (Fews Mountains). The pathway up the mountain offers some beautiful views over the surrounding countryside. This was an excursion that stirred some excitement for me. I have long been a visitor to Sliabh na Calliagh, Loughcrew, hills in Meath scattered with ancient megalithic remnants. The two - Loughcrew and Slieve Gullion - are not only connected through their eponymous hag/goddess, but also through an alignment involving winter solstice. As you get to the top of the path the cairn finally comes into view. The path twists and turns and has been nicely laid out with smooth rocks in places, gravel in others, and just turf pathways in others. However, about halfway up things become more steep and the climb is a wee bit more arduous. This was no deterrent for my 14-year-old twins, who looked as nimble as Legolas running along the mountain ridges of Middle Earth. We met a man who said he was waiting on a bus! I suggested perhaps he was waiting on a helicopter. Truth be told, it might even be possible that a fairy bus does pass this way every once in a while. 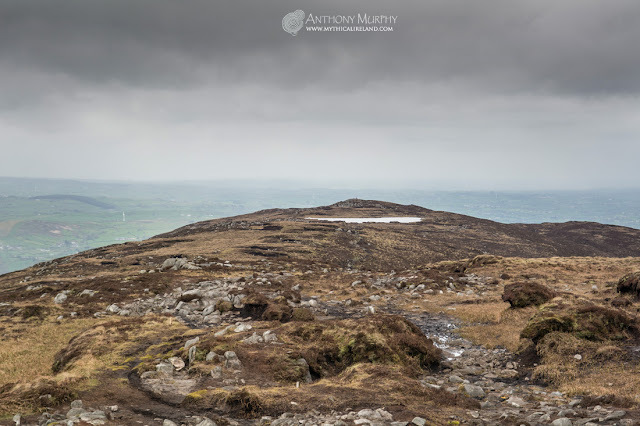 The Calliagh Berra's Lake on the top of Slieve Gullion. Beyond it is another cairn, called the Northern Cairn. 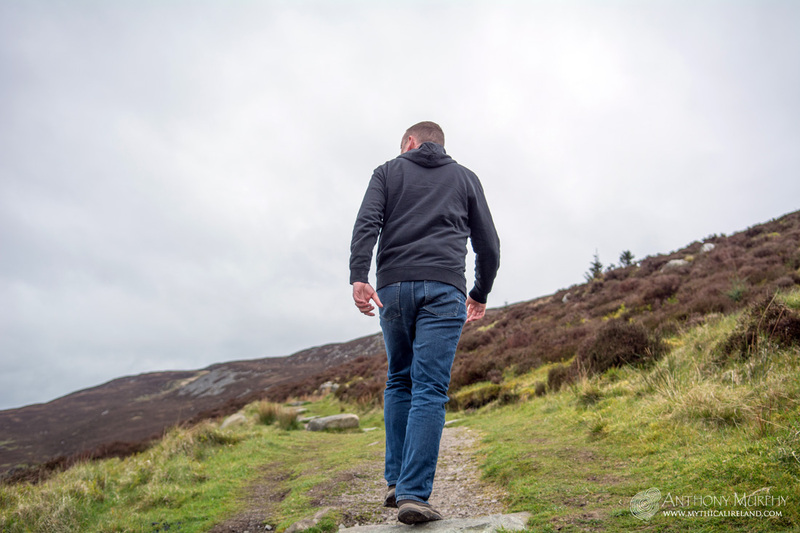 Fionn walked up the slopes of Slieve Gullion to the lake near the summit to find a beautiful young lady sobbing on the water’s edge. Being a gentleman he enquired as to why she was crying; to which she replied that she had dropped her golden ring in the bottomless lake. 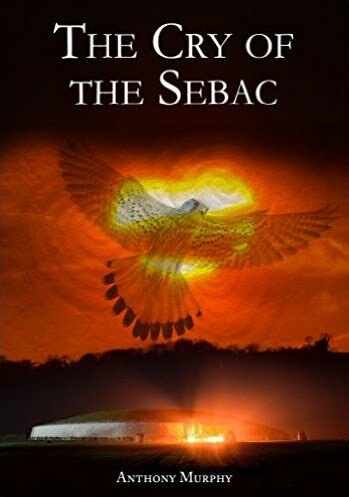 Without a moment’s hesitation Fionn ripped off his shirt and dived in, swam down until he found the ring, grabbed it and returned to the top only to find an old hag laughing, the Calliagh Berra. The witch had tricked Fionn and he fell out on the lake’s shore as an old withered man. When Fionn came down the mountain, no-one recognised him, not even the Fianna! However, when his trustworthy Irish Hounds smelled the old man they knew that he was their Master. Fionn, the Fianna, and the hounds forced the Calliagh Berra to restore Fionn to his youth, but it is said that his hair remained white like an old man’s for the rest of his life, and that his fate is said to befall anyone who bathes in the lake to this very day. Are you brave enough to dip your feet in the Calliagh Berra’s lake? The cairn itself is known as Calliagh Berra's House and is just one of many ancient megalithic remnants that is named in her honour. At last we got the opportunity to enter its ancient passageway. It seemed like I had been waiting to do this for a long time. I've only ever imagined what it would be like because I had never seen it before. You have to hunker down at the entrance which takes a bit of nimble movement, but once inside the main thing to concern yourself with is the rocks on the floor. It would be very easy to sprain an ankle in there because the floor is so uneven. Inside the chamber of Calliagh Berra's House looking out through the passage entrance. The chamber and rear recess of the passage-tomb on the top of Slieve Gullion. You certainly get the sense of a devoted, determined and stoic people. They built this cairn out of rocks - large and small - on top of a mountain in a far-distant age (around 5,000 years ago, maybe more) at a time when there was no proper footwear, and nothing like construction site health and safety. Building passage-tombs must have been a dangerous occupation in those times. It takes effort just to climb the mountain. But then to start hauling stones around the place in the cutting wind and inevitable rain must have been an undertaking requiring a serious devotion to the task. Calliagh Berra obviously commanded a pious respect among the ancient megalithic builders. Another thing that strikes you is the lack of megalithic art. 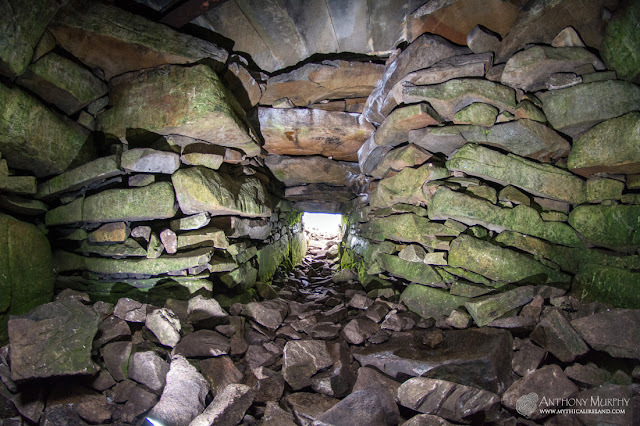 And indeed the lack of enormous structural stones such as those you find at Newgrange, Knowth and Dowth - the large corridor orthostats, the bulky ceiling cap stones, the three-tonne kerb stones. This is a different type of structure to the Brugh na Bóinne complex. Similar in some respects, but different in others. Sitting at the entrance of the passageway into Calliagh Berra's House. They say first impressions last though. And Calliagh Berra's House made a deep impression on me. Such that I can say I would love to go back - and soon. Ideally in better weather, which makes for better photos. A trip up there for winter solstice sunset would be a distinct possibility. I'd love to see the sun shining in there as it sets beyond the distant hills of Loughcrew. One thing that did slightly disappoint was the lack of a marker for Loughcrew on the direction plate on top of the cairn. However, even on a murky day like today the views are still beautiful. On a clear day, it's apparently possible to see the Slieve Bloom Mountains some 85 miles distant. Upon turning to leave, it's not difficult to see how landscape made such a deep impression upon the imaginative and creative sensitivities of ancient people. Ireland is a beautiful country. I am reminded of this constantly. The journey back down the mountain created a greater awareness of that fact than the journey up. When you climb a hill or mountain, you are ever looking on ahead, upwards, towards the summit, the goal. You have a determination, and must concentrate your energies on getting there. On the way down, it's as if you have lightened your load, and the landscape unfurls beneath you. Even with the approaching rain, it looked heavenly. And that's a stark reminder of the real power that elevated megalithic sites must have had - engendering a sense of detachment from the sublunary world, providing an encroachment into the upper, divine levels, away from humdrum civilisation and altogether closer to something austere, numinous and regenerative. Speechless. Your story reminded me of climbing up to Knocknarea. I can't imagine how you must have felt entering the mound. Always appreciate you sharing your stories and photos! Thanks Dana. Glad you enjoyed the post. 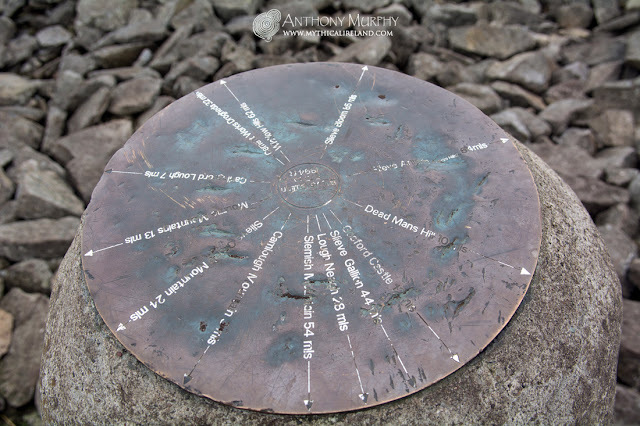 I plan to go back to Slieve Gullion. It left a big impression on me. Lovely photos Anthony! Thanks for sharing. 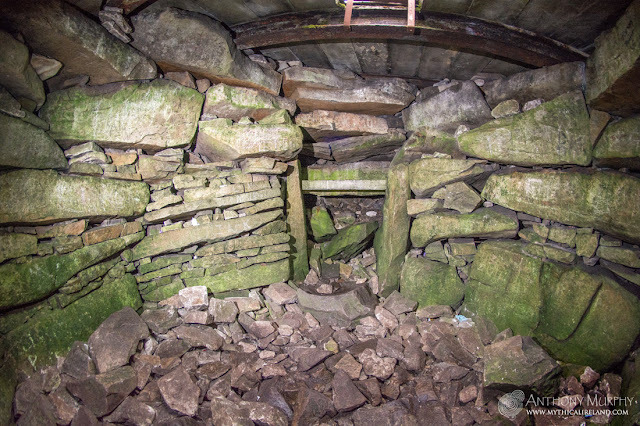 Question if I may- the original roof stones are now on the floor of chamber and roof has been replaced with cement or some such? Thank you Lisa. Yes, the ceiling is modern. Not sure when it was repaired. This has been done at other places too, such as Dowth South, Cairn L Loughcrew, and Fourknocks, for example. At Fourknocks, the new roof is a huge concrete dome. Keeps the rain and frost off the carvings!